So I asked myself, “Do I need to speed up combat?”. A year ago, you’d have heard me give a resounding, “YES!”. I was still youthful in my experience as a DM in 4E, having spent most of my time running far simpler versions of the game decades ago. I was a strong proponent of gridless combat and theater of the mind. I avowed collaborative storytelling and eschewed what I understood at the time to be a heavily mechanical design shift underpinning all of 4Es combat. To put it simply, I thought combat took too long. And, embarrassingly, I endeavored to recreate the combat of previous editions in my 4E game. A year and several gaming groups later, I’ve come to different conclusions. My understanding of the workings of 4E and its “underpinnings” has changed markedly over that timeframe (much thanks to Brian Engard and this great site in helping with this). I’ve seen all sorts of gamers chew on the rules and spit out wildly different results. I’ve learned that not only is beauty in the eye of the beholder (not THAT beholder) but so too is “speedy combat” in the eye of the gaming group. While one group might grind to a halt at the 45 minute mark, another would burst into the second hour full of energy. I started to put things together and came to some conclusions. These conclusions have lead me to make changes to my own games. In this article, I’m thrilled to have the opportunity to share one of them with you. The most successful initiative I’ve tried over the multiple gaming groups I’ve run 4E for has been what I call, “The AWESOME card”. It was derived as a response to something I noticed happening at every table I ran for and played at in the 4E era. Players would flip through their character sheet scouring over their juicy powers and feats. The funny thing is, they would do this in an almost unspoken effort to find something that wasn’t there. I could see the looks on their faces almost as if to say, “Hmmm, this looks good, but not quite right”, or “Oooh, I like that one but I better save it for later”. To this, I wanted to shout out, “NO! your character sheet doesn’t have the answer!” “Just do something AWESOME!” That’s when it hit me. What SHOULD they do? Did the awesomeness potential of the character begin and end during the process of choosing powers? I certainly hoped that wasn’t the case. So I decided if they couldn’t find that “perfect” power on their character sheet, I’d help them make one up on the fly. And when they did so, I’d reward the effort with a power card of my own, something that says, “You did something creative and entertaining and we all enjoyed it!” I’d give them an “AWESOME! Card”. My first step towards insinuating this new “mechanic” into my game was to demonstrate what was possible. As a DM, I started really describing the actions of the enemies. I’d tumble around opportunity attacks and one enemy might leap on the shoulders of another as they both got combat advantage positioning before falling prone in a heap on the floor. My players were initially stumped as as I bent the rules to the breaking point and played up the strengths and weaknesses of the enemies they faced. But it didn’t take long for the craftiest of my players to return the favor. He asked if he could “try” something and my eyes lit up. I was prepared to say yes to my own execution at that point. His idea was great. It was well within the “exception” based rule system of 4E and when he was finished, everyone was impressed. Immediately, they were looking over at his character sheet for something they had missed. We had all visualized an action that was significantly more interesting than “State power, role dice, announce damage”. Don’t get me wrong, sometimes, that’s exactly what needs to be done, but in general, flavoring things up can be a lot more fun. After he completed his epic turn, I looked to the next person in initiative order and said, “Well, what are YOU going to do?” And to this day, we’ve never looked back. Recently, one of my players informed me, he doesn’t even look at his list of powers anymore, except to try to find some mechanics that make sense for what he wants to do. Ok, so you’ve shown your players what “awesome” looks like and they’ve even tried it themselves. Isn’t that enough? Sadly, I wish it were so. Unfortunately, with 4E combat being very tactical with powers that make life so easy by telling you essentially what 6 actions are available to a character, it’s easy to fall back into old less-exciting habits. 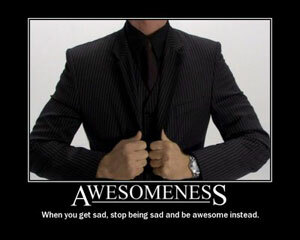 That’s where the AWESOME! Cards come in. Each time one of my players does something really creative, clever, or simply entertaining to the group, I hand him or her an “Awesome” card. It’s essentially just a reformatted homebrew power card that says some funny things and gives a reward. A few examples of the rewards are that perhaps you get to reroll a missed attack, regain a healing surge, recharge an encounter power, or even roll a special giant D30 that I keep around for fun. These concrete mechanical rewards make the creativity feel that much more awesome. Players feel a sense of achievement more frequently through the course of the combat. This breaks up the work and reward cycle that comes from working hard to achieve a goal. If they work for 1 hour to achieve a goal (defeating the enemy, surviving, escaping), things can get stale because this one singular goal takes a long time to achieve and no single action stands out as making the achievement possible. Then when they finally achieve it, it can feel almost anticlimactic. However, if there are smaller intermediate goals that can be achieved, it removes the sense of slowdown one can get as combat draws toward the hour mark. The bite sized bits of greatness keep things surging forward and keep everyone entertained as each player tries to find some fun thing to do rather than decide which power would be the most effective at that time. The players worry about their characters and what they would actually do, rather than calculating the most DPR possible. Now, if you LOVE calculating DPR or dropping mind numbing Novas, that’s great, there’s no “right” way to play D&D. But I’m of the mind that 5 people calculating DPR is generally not going to be as entertaining to watch over an extended period. (although Novas can be pretty amazing) Now, if you want to calculate DPR as well as do amazingly creative things, then I’m all for it. That’s what I would describe as “winning” D&D. The last thing I’ve noticed since I’ve started using Awesome cards with all my groups is that the players interaction with the game world seems to be more under their control. What does that mean exactly? To be honest, it’s hard to explain. These awesome cards work much like an Action Point, in that you choose to use it when you feel it would be most beneficial or interesting. This gives the players more agency; more depth in how they can control the game they get to play. And, in the case of the re-roll awesome card, it keeps the dice rolling. Nothing I’ve seen has greater impact than getting that high die roll when you’re really in a crunch. Nothing is more devastating than when you get just the opposite. With a re-roll card in your pocket, you can more frequently experience the best of both worlds. You can fail spectacularly and still have a shot at saving your hide. You have more chances for those elusive crits. In the end, it just gives the players that much more reason to do something fun, entertaining, and NOT predetermined by a character generator. So this brings us back to the initial question posed by Marcelo. DO we need to speed up 4E combat? I think the answer is a resounding……not necessarily. Combat really only needs to be sped up if it’s too slow. It’s only too slow if it lasts longer than your players interest and it will mostly likely only last longer than your players interest if something isn’t happening during combat to pique that interest. Well, I’m here to assert that finding ways (one is via in-game rewards) to incent players to entertain themselves and each other through their characters actions. A side benefit of this is that it takes a lot of load off the Dungeon Master as entertainer. It also helps make the game more fun for him or her, as well as everyone at the table. And, isn’t that it’s all about?